Like so many creative ventures, Skyros was born out of a meeting between dreaming and despairing. We were suffering from the seventies confronting the failure of the dreams of the sixties to materialise in the way we expected. When we despair of the world we live in, yet carry a picture of how it might be and a faith that it is possible to go there the moment is always charged with creative power. The intention of Skyros was always to create a world that heals. This did not simply mean a healing of individual past hurts, but rather something more ambitious: an attempt to create a healthy culture. This culture must be one that encourages us to come home to ourselves, to honour our true selves relative to others, and to commit ourselves to the most universal values we can find. Such a world cannot help but heal us into new ways of living, loving and contributing. One key to this world that heals is the word community. In a sense, Skyros would not have taken this form had I not myself been longing for a community. Always in my life I had been confronted by the split between community atmospheres in which I flourished, and institutional environments in which I shrank into myself. These began in childhood and adolescence with my conventional Jewish day school and my Socialist Zionist summer camps which were run as communities. I used to think I had two personalities, one in school and one in camp. Then there was my radical Brandeis University undergraduate programme (starring Herbert Marcuse and Abraham Maslow) where I was challenged to explore, followed by a rigid postgraduate Clinical Psychology programme where I was seen as someone who needed social control. Just before we started Skyros, I was facilitating weekend personal development groups filled with honesty and love and then confronting awful Polytechnic politics on Monday morning. I literally shrank as I walked down the Polytechnic halls. So I knew something about the kind of environment which would make me happy and open to transformation. I also knew that this was not just true for me. In my picture, institutions are built of walls of brick and stone, indifferent to our coming and going; if we don't like them, we vote with our feet and get out. Communities have walls made of people; if we don't like what is happening, we move ourselves into a better shape by being both responsible and responsive. But not any old traditional community will do. We cannot go back. We need to go forward to soul communities. In traditional communities such as old style villages, we are held warmly, but our souls are not given breathing room. We are greeted, known, cared for, but are also controlled by old rules, roles and expectations and in particular by that great social control mechanism called gossip. A soul community, in contrast, is one in which we are loved and recognised for whom we are and who we are becoming, and not for what we should be, and what we have been. 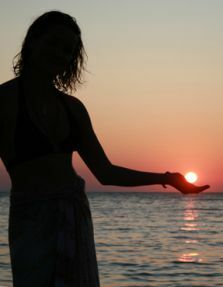 Only a soul community can free us to become ourselves in a way that allows us to maintain our connectedness to others. I used to go around in the early days of Skyros asking people 'Would you rather be loved or be free?' In a soul community, these are indivisible. 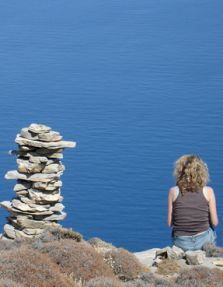 Skyros is also a 'symbolic community' as opposed to a long term living community. It offers the short term educational and transformational experience of becoming a member of a tribe without sacrificing our individuality. The intention of a symbolic community is not to retreat to a new world, but to inform, illuminate and expand everyday life in the world we live in. In creating such a short-term community, we knew that we needed to find ways to encourage people quickly to let go of their normal rules, and become active members of community life. In such an atmosphere everyone, including the staff, is learning and growing, and has a sense of belonging and a commitment to truth. A community in which those who facilitate the process are not honest about themselves is never a true soul community. Skyros is therefore based on a series of interlocking communication structures, including the community meetings, the staff groups, the oekos or home groups, the courses, the work groups, co-listening in pairs, the communication with oneself. These simple and safe communication structures open the possibility of 'real talk' and 'real listening' speaking and listening in which we are at once fully present to one another and to ourselves. These structures - and a staff selected not only for their skills but for their qualities of authenticity and warmth - have successfully created soul community session after session for 25 years. This consistency is remarkable given a constantly evolving staff team and participants. The process cannot finish when people leave the premises; it needs to be supported and maintained back home. For this, we need bridges. One important bridge is continuing contact with the people with whom we have the kind of deep connection that is forged in a soul community. Such a bank of people holds us at that delicate moment when we are peeping out from the chaos of not-knowing into new ways of being. Recently, as I have worked with the growing phenomena of burnout, I have begun to understand why modern society spawns both burnout and places like Skyros as two sides of the same coin. We live in a world where our choices go far beyond those of our parents. We are not expected to have the one career or even relationship for life, nor do we wish to stop growing and developing when we reach middle age. Yet we constantly come up against contradictions in the world and in ourselves that keep us stuck and hurting. Against this background, we burn out when we come to an end of a particular road and cannot acknowledge it because of some central picture of ourselves we want to preserve. Our soul is whispering and we are not listening. Skyros, and places like it, offer an opportunity to people to step back and listen to their soul in order to let go of past identities and find a new way of living. It gives choice a chance. There is also something else that I cannot account for by simply describing what we did. 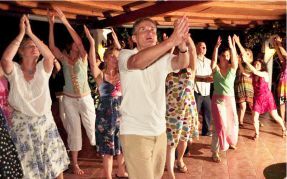 When we started Skyros, it was if we'd invited people to a party on a Greek island and they all came. People laughed, danced and played, as well as sinking into a deeper part of themselves than they thought possible. Miracles were commonplace. Relationships were formed in a kind of crucible so that people felt they had known one another forever, and often became friends for life. As one participant told me, if you met anyone anywhere in the world and they said they had been in Skyros, you immediately knew you could have a deep connection with them. Many felt this was the turning point in their lives or that it was their best holiday ever - or both. Everywhere I went in the world I'd meet someone who'd been to Skyros and had a wonderful story to tell about their transformation there. I believe that this something else emerges when we intend to create something from the soul, and are willing not only to foster love and truth, but to work towards our own transformation. When we started Skyros, we had very little self esteem, but we did have a kind of soul esteem the belief that if something was right to do you did it, and you didn't count the cost. My old friend, the late Max Furlaud, used to say, 'In Skyros, every Thursday night at the end of a two week session, the angels gather round.' This is a kind of grace, the gift of the soul.